Mmm. What a delectable treat. A creamy custard concocted for the sole purpose of coercing and coddling your tongue with countless culinary sensations, strong enough to turn even the most crass curmudgeon into a charming cherub. Yet again jumping off the angel food cake, I was left with 12 fresh yolks. Mom used a few to make some spectacular meatballs, but I still had about 9 left. What can one do with a massive amount of yolks? Quiche usually uses whole eggs, but custard uses yolks! 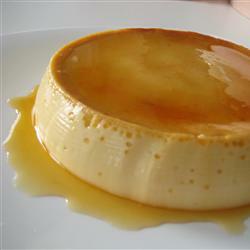 But I wanted a twist…how about a crème caramel (= flan)?…and that is where the story begins.